Russia-backed militants did not decrease the intensity of the attacks in the combat zone, yet they shifted their focus to Donetsk sector yesterday. Militants opened precision fire 14 times and used 82-mm and 120-mm mortars having fired a total of 134 rounds. Ukrainian troops returned fire 10 times, reported Ukrainian Ministry of Defense spokesman on ATO Colonel Dmytro Hutsulyak at a press briefing at Ukraine Crisis Media Center. In Luhansk sector, Russian proxies violated the ceasefire four times yesterday. They fired seven 120-mm mortar rounds near Troitske and Lozove. “Militants attacked Ukrainian troops’ positions in Maiorske and Travneve areas with grenade launchers and small arms,” Colonel Hutsulyak said. In Donetsk sector, Russia-backed militants made ten precision attacks. “The Shakhta Butovka area stood as the hottest spot, where the total duration of the attacks amounted to three hours,” the ATO spokesperson said. “Militants fired forty-four 120-mm and forty-seven 82-mm mortar rounds and delivered a 90-minute attack involving grenade launchers and small arms,” Colonel Hutsulyak added. Russian proxies used 120-mm mortars outside Novotroitske and Vodiane as well. Near Pisky Ukrainian troops recorded another hostile attack involving 82-mm mortars. Militants also delivered precision attacks near Krasnohorivka, Kamianka, and Novotroitske using small arms, grenade launchers and IFV-mounted weapons. 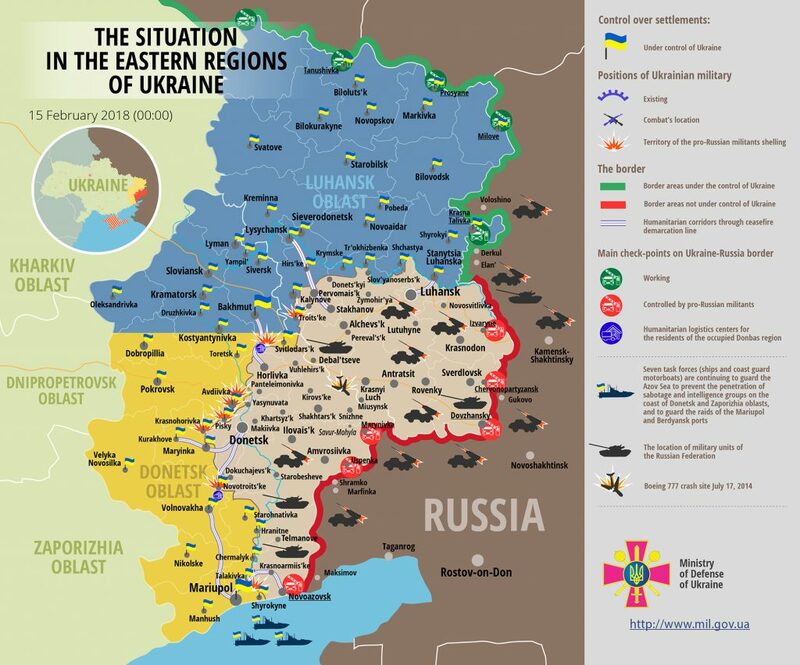 Unfortunately, four Ukrainian troops were wounded in action over the last day. “As reported by the ATO Staff, the Military law enforcement service of the Ukrainian Armed Forces and the National Police are investigating deaths of four servicemen from a naval infantry brigade. This is all the information we have about the incident at the moment,” the ATO spokesperson said. Report on the military developments as of February 14 is available here. Interactive data on the shelling: chronology shelling chart and the interactive map.